"Our number 42 Bandit Chippers Dodge Charger was really good tonight," said Kligerman. "This was the first Nationwide race that I've started up front, ran top 10 the whole race and had awesome pit stops up until the second to last stop where we dropped a lug nut." Despite the error, Kligerman made a strong comeback and was poised to move back into the top ten when he simply ran out of time. "For a small team like this to run with the big dogs is great," said Kligerman. "We know that we're fighting above our weight. They (the crew) did a great job all night long." Kligerman's part time 2010 Nationwide Series effort had him starting 12 races, four of which featured Bandit Industries and the Pelletier Brothers as Team 42 sponsors. "The Pelletier Brothers are the reason we looked into a sponsorship," said Bandit Industries Large Equipment Sales Manager Travis Lint. "They are good friends of ours and we couldn't ask for better partners in an endeavor like this." Bandit's NASCAR debut came in August at Bristol, where as a secondary sponsor, the Pelletier Brothers/Bandit Industries Dodge under Kligerman's control cracked the top ten for the first time, finishing ninth. Bandit stepped up to a primary sponsorship for the October 2 race in Kansas, where Kligerman was robbed of a top ten finish when he was tapped on the last lap, ultimately knocking him down to 24th spot. The Bandit raccoon returned to the hood on November 6 for the race in Texas, where a broken clip in the steering had Parker fighting for control until he was tapped yet again, finishing 34th. "The best thing you can do is just put it behind you," said Marc Browning, Team 42 crew chief on getting spun out. "If you drive on it, it's just going to put us in a negative atmosphere. It's really frustrating, but all we can do is keep putting cars together like that and keep them up front. If you're not going to run up in the front, you could keep one car and never hurt it. But if you're going to get up there and race, well, that's why they wear helmets." 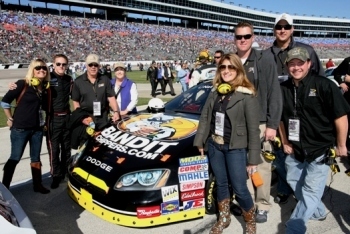 Despite the ups and downs, Bandit Industries was very excited and proud to be a part of Team 42 Racing for the 2010 Nationwide Series. "Our first NASCAR experience has been incredible," said Lint. "We got lucky; Parker is a fantastic rookie driver, Marc Browning is a great crew chief, Darrell Blanton and Eddie Smith have been more than welcoming and helpful. The whole team is great, right down to the pit crew who leave nothing at the track when they leave." Rumors suggest Kligerman could move to NASCAR's Camping World Truck Series next year. Bandit's future in the world of NASCAR has yet to be determined, though many possibilities are being explored. "We just hope our customers continue to support us," said Lint. "And with their help, we just might be in Daytona come February."